Before we start another wellness campaign, I decided it would be helpful to more formally articulate our goals for our wellness program. As I’ve been participating in wellness discussion outside of ASHA, I’ve noticed a trend toward broadening the focus. I'm wary of getting caught up in dong what’s “hot.” I hope clear goals will help us evaluate what is right for us. 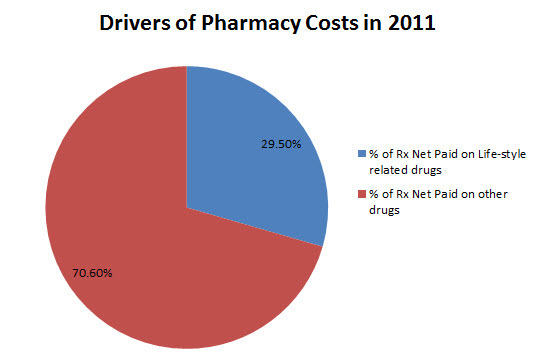 Minimize/reduce the overall percentage of drug costs to treat life-style related conditions. Maximize the number of staff and their family members completing screenings that are recommended for their age and gender. Maximize staff productivity and minimize sick days taken. Help ASHA staff to be more health-conscious consumers. Make the N.O. a place where active living is an easier path. Enhance the sense of camaraderie and teamwork among ASHA staff. I consulted with Rob Mullen, ASHA's National Center for Evidence-Based Practice in Communications Disorders Director, and he pointed out that this is an eclectic mix of distal and intermediate goals. We discussed measurement which poses an interesting challenge -- especially for an organization that is fully insured. We do have access to data from UnitedHealthcare that will help us measure the first two goals (note charts.) We can measure the third goal easily enough if we make it a priority. Measures for goals 4, 5, and 6 could be included in our existing staff survey. I'll be working on collecting additional baseline and comparison data. Then, we can more systematically determine what areas need improvement. I’d like to follow what ASHA advocates as an association and take an evidence-based approach to what we do. For example, I’ve read some studies recently that suggest being active has a more positive impact on health than losing weight. To the extent the information is available, I'd like to dig in and look for evidence-based behavioral solutions that have been shown to work long-term. I am confident we can still balance this with keeping the program fun and engaging, especially given goal six. Many thanks to Rob for his advice and coaching and to Bob Merberg for all of his thought provoking posts on evidence-based wellness. You guys make me think. This is all still a work-in-progress and I'm seeking feedback. Please share your thoughts with me. Thanks to everyone who provided feedback. I posted the "final" version of our goals here on June 7, 2012. My comment was way too long so I copied it and sent it to you in an email. I think it's terrific that you've publicly posted your thoughts around the wellness goals for ASHA.